It's the greatest story ever told - and it began with 12 words! A dynamic and compelling teacher, Louie Giglio proclaims the triumphant message of Jesus' birth - God is with us, full of grace and truth; no one is beyond the reach of his love; and he's at work in you, even in the midst of life's messiness. The Twelve Words Of Christmas (Passion Talk Series) DVD by Louie Giglio was published by 286 Store in October 2012 and is our 14828th best seller. The ISBN for The Twelve Words Of Christmas (Passion Talk Series) DVD is 5099967949557. 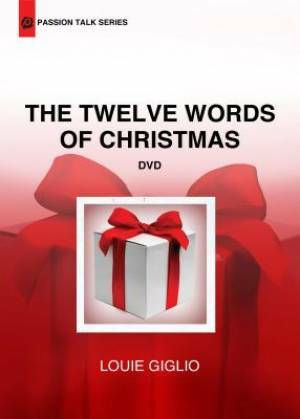 Be the first to review The Twelve Words Of Christmas (Passion Talk Series) DVD! Got a question? No problem! Just click here to ask us about The Twelve Words Of Christmas (Passion Talk Series) DVD.